Indoor and outdoor thermometers are most of the time digital temperature gauging devices that can measure the indoor and outdoor temperature at the same time and display it on an LED screen for easy reading. What the best indoor outdoor thermometer is can be very different for and depends on your specific situation. We took a look at 5 of the best and most accurate indoor outdoor thermometers based on the reviews, feedback and consumer reports. Although this is a bold statement I think we can say it is true. 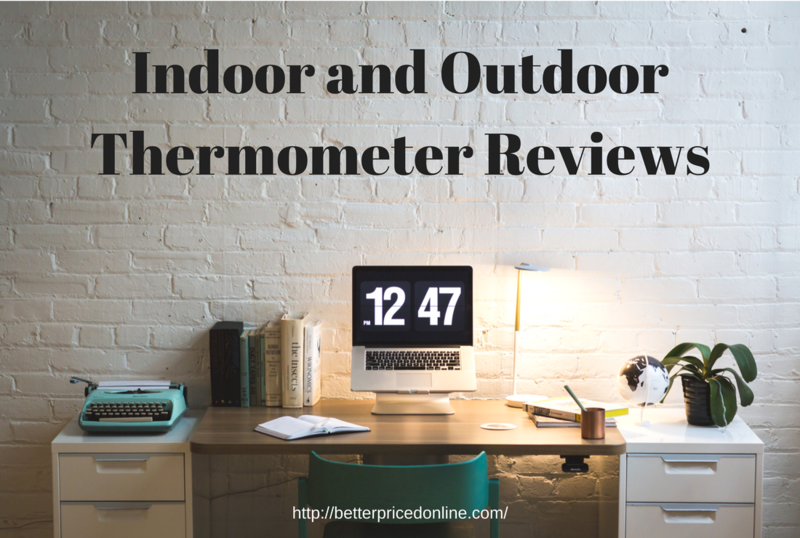 We looked at ton of reviews, home owners meanings, ratings and prices to come to our top 5 indoor outdoor thermometer review. 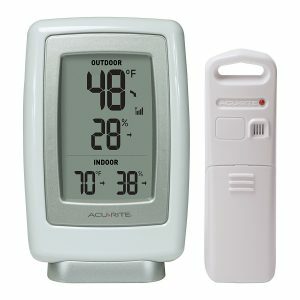 This Ambient indoor outdoor thermometer comes with 3 or 4 sensors depending on the model. The sensors can also be used as a hygrometer. We have found some answers to questions you might also have. The batteries last a long time since the sensor only update once every minute. Someone mentioned that his lasted for 3 years and are still good. Although the unit is rated for 300 feet this is only when there is nothing between the sensor and the indoor unit. As always I looked a the lower reviews first and found that most of them talk about problems with the connection between sensors and base unit and that the distance between the two can not be to high. Higher ratings mention the total opposite. 86% of the raters gave it a 3,4 or 5 star rating of which 54% 5 star ratings. One option when you buy this thermometer is to let it set up by an experienced installer so you do not have to deal with the setting. 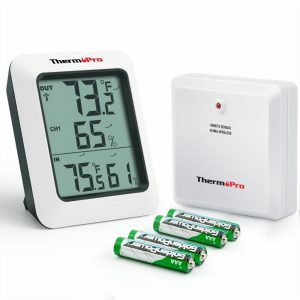 This ThermoPro is the number one seller on the larges online store and over 300 buyers gave it a 4.4 out of 5 star rating. The ThermoPro company has a very good reputation in the grill thermometers and is a number one seller. There is an option that shows if the temperature is gone up or down and a 24 hour review memory to see what the range was. The base unit and the sensor both require two AAA batteries that last a long time. 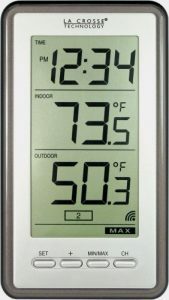 all together this is a very nice indoor outdoor thermometer that we can recommend as a good buy. When it comes to this type of thermometer the AcuRite brand shows up everywhere and reason for this is the excellent quality. The 00611A3 model is one of their best sellers and we found over 2100 buyers in one online store only. Let’s see what we can find to see if all these features are as good as it looks. One thing we found is that it is best to hang the sensor not attached to any glass. The heat will affect the reading. Depending in the quality of the batteries they will last over a year for the outside unit and indoor unit even longer. Someone advise to use lithium batteries for outside and alkaline for inside. One of the things we found that a lot of people like is the large numbers on the display. The second thing is that you can read the day high and low by pressing a few buttons. Like all other wireless devices the advertised distance is when there are no obstacles between the sensor and receiver. The maximum is advertised as 165 feet. Many people mentioned that they had no problem with a 30 feet range. Although there is higher number of lower ratings and this makes the average go down to 3.9 stars there are still over 77% of the buyers that give it a 3,4 and 5 star rating. To be hones I think some buyers expect a 200 dollar value from a under 35 dollar product. TIP! Find the low price here! 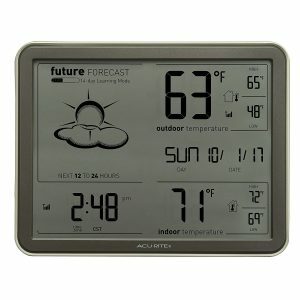 This is an indoor outdoor weather station with an atomic clock that updates for daylight savings time. Available to purchase with several options depending on your specific needs. Options like: Monochrome display and or a Color display. I have found over 1800 people who took the time to write about this thermometer and what they thought about it. Personally I think that the 4 star rating is a little low after reading a ton of the reviews. Like we read before it is advised to use lithium batteries for the sensor outside and you can use regular alkaline for the base unit indoor. The manual tells you to hang the outdoor sensor in the shade and at a height of 4 to 8 feet to avoid it to read faulty because or the direct sunlight. One of the thing that came back over and over is that this unit is pretty accurate and that is what most people liked about it. This explains the 83% 3,4 and 5 star ratings. The lower ratings mentioned a faulty unit and or that the display is hard to read if not set up at eye level. LaCrosse is another brand that cannot be missed when you review indoor outdoor thermometers. We had a good look at one of their best selling La Crosse wireless thermomters and this one is actually the best seller in indoor thermometers in a large online store. We found again a lot of people who bought this indoor outdoor station. Over 3800 buyers that wrote about their opinion. 3.8 star average seems to be a little low that is why we have to dig a little deeper. The lower raters mentioned that the outdoor sensor does not last to long in extreme conditions. With about 72% giving it a 4 or 5 star rating but 23% giving it a low rating I am not sure what to tell you about this La Crosse thermometer. I suggest that you read through all the reviews and make up your mind. But one thing I like to mention is that you can not expect to much out of a product that cost around 15 dollar. It is not easy to give advise on what the best indoor outdoor thermometer is and where to buy it. It all depends on what your expectations are and the features you need and of course how much money you like to spend. if you like to monitor the temperature and humidity in a basement or attic the sensor will not be exposed to much outdoor rain and temperature fluctuations and could be a little cheaper. 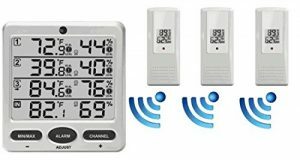 If you need on of the most accurate indoor outdoor digital wireless thermometers with humidity or like some people call it an hygrometer you will have to dig a little deeper in you wallet. On this page we looked at affordable and still reasonable accurate thermometers for indoor and outdoor use.